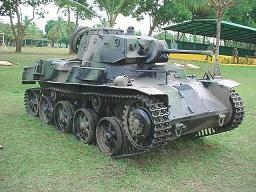 The Swedish Strv L/60 Light Tank was first seen in 1934. The vehicle focused on a high rate of mobility as a spring board to future designs such as the M/39 and M/40 Light Tanks. The L-60 vehicle was sold to Eire and Hungary for licensed manufacturing under the designation Toldi 38M.